Police in southwestern China’s Sichuan province attacked a group of Tibetan villagers without explanation at the weekend, injuring ten and sending several, including an elderly man, to the hospital, Tibetan sources said. The Aug. 25 assault was launched against a group of Tibetans from Gorum village in Draggo (in Chinese, Luhuo) county’s Tsogo town who were enjoying a picnic “on their own land,” a Tibetan living exile told RFA, citing sources in the region. “Suddenly, a group of about 30 police officers arrived and surrounded the Tibetans for no apparent reason,” RFA’s source said, speaking on condition he not be named. “They searched the Tibetans and forced them to stand in a line after putting their belongings on the ground,” he said. When the Tibetan village head, who was present at the scene, called town and county officials to complain of the harassment, two policemen beat him and took him into custody, and a county official who had led police to the site then ordered his officers to attack the rest of the group, the source said. In the beating that followed, ten Tibetans were injured, “with one elderly man of about 70 so badly hurt that he had to be rushed to Chengdu city for emergency attention and care,” the source said, adding that others who were injured—including one with a broken rib—were taken to local hospitals. Following the assault, local Tibetans demanded an explanation from county authorities, saying that innocent Tibetans had been attacked for no reason, and that the role of the police should be only to “protect the local community in accordance with the laws of the land,” the source said. Copies of the appeal were also sent to authorities in Sichuan province and the Kardze (Ganzi) Tibetan Autonomous Prefecture, he said. No word of a response from officials was immediately available. Chinese security forces swarmed Draggo in large numbers three years ago in an apparent attempt to prevent county residents from observing the anniversary of a violent crackdown on Tibetan protesters in January 2012. Shopkeepers in the county were later ordered by authorities to hand over all stocks of photos of exiled spiritual leader the Dalai Lama, with “severe punishment” threatened for those who failed to comply. Chinese police brutally assaults Tibetan picnic group in Gorum village in Draggo, Sichuan province in Tibet. According to the news report from the Radio Free Asia, Chinese police personals suddenly attacked a group of Tibetan villagers on a picnic on August 25, 2017. The source reported that the police officials brually attacked the Tibetans without any explanation. 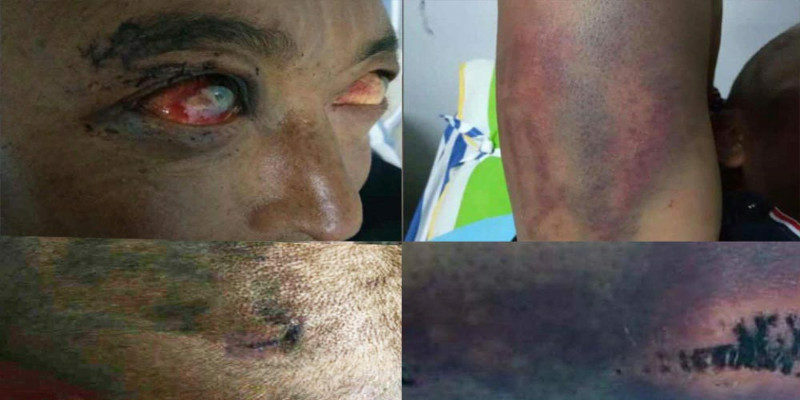 “Police in southwestern China’s Sichuan province attacked a group of Tibetan villagers without explanation at the weekend, injuring ten and sending several, including an elderly man, to the hospital, Tibetan sources said.” said the report in Radio Free Asia. “The Aug. 25 assault was launched against a group of Tibetans from Gorum village in Draggo (in Chinese, Luhuo) county’s Tsogo town who were enjoying a picnic “on their own land”. Suddenly, a group of about 30 police officers arrived and surrounded the Tibetans for no apparent reason,” RFA quoted the source as saying. When the village head tried to contact their county officials to complain of the harassment, two of police personnel beat him and took him into custody. To the worst, the county official that had accompanied the police directed the police to attack the rest of the villagers. “In the beating that followed, ten Tibetans were injured, “with one elderly man of about 70 so badly hurt that he had to be rushed to Chengdu city for emergency attention and care,” the source said, adding that others who were injured—including one with a broken rib—were taken to local hospitals.” added the report. The local Tibetans have demanded explanation from the county authorities, authorities in Sichuan province and the Kardze (Ganzi) Tibetan Autonomous Prefecture, through an appeal to which they did not receive any response. This entry was posted in Chinese police, Uncategorized and tagged Chinese police, Draggo, Human Rights in Tibet, Tibetans in Tibet. Bookmark the permalink.